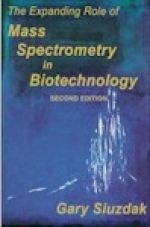 "The Expanding Role of Mass Spectrometry in Biotechnology" by Gary Siuzdak (2nd edition 2006) ISBN 0-9742451-0-0. Paperback. Mass spectrometry has become one of the most important tools in the biochemical sciences with capabilities ranging from small molecules analysis to protein characterization. Because of this versatility, mass spectrometry is the technology many scientists are turning to. Features include protein identification; protein, carbohydrate, oligonucleotide, and steroid structural analysis; pharmacokinetics; high throughput screening; clinical diagnosis; and more.